When Calliope Brown's Uncle Nestor dies, he leaves her all of his personal belongings - his papers, photos, some cash and the things that he has collected over the years. In order to collect her inheritance Calliope must travel back to Patras, and sort through them. She hasn't been back to Patras for quite a few years and she is eventually convinced that she should return, albeit reluctantly. What is clear from the beginning is that Calliope's mother Clio doesn't want her daughter to come back to sort through Nestor's belongings. And once Calliope is there, Clio does her best to put roadblocks in her way. It is just as clear that there is something that Nestor wanted Calliope to know, and, whatever it is, the secrets are to be found in the belongings that he has left to Calliope. But what could he be trying to tell Calliope through the old photos, letters and other knickknacks. Whatever it is, it is to do with Clio and the past, something that the two siblings were fighting about even on his deathbed. This visit also gives Calliope the chance to find out a little more about her family's past. Once, they were a well to do family who lived in a beautiful house and had a farm, and now they don't. It's all just gone. Once, the Notaris family was well known on the island, but now they are just another family and Clio doesn't know how it was that they lost everything. There was a lot to like about this novel. I really liked the contrast between the current time and the past Calliope happens to be visiting Patras during Carnivale, a time of parades, of partying especially the Bourbouli dances where the men all dressed up in their finery and the women all wore masks and cloaks to "hide" their identities, of feasting, and most importantly of family gatherings. When compared to the austerity of a town under occupation during World War II, initially by the Italians and then by the Germans, the contrast was marked. The author had me wanting to visit Patras during Carnivale, to see the colour and the pageantry for myself, and I liked how she showed some of the progress that was being made to modernise. It is interesting to note that the modern part of the story was set in 2000, so just before all the economic difficulties that have really affected Greece over the last few years. There were also some beautifully imagined scenes included. 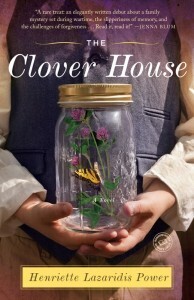 For example, I had never heard of clover houses before, but the way they were described sounded like perfect places for the young Notaris children to play, and the scene where Clio's mother created butterfly wings out of the parachute of a fallen Italian airman was beautifully written. One of the things that may be harder for a reader to connect with is the characters. Calliope's relationship with her mother could only be described as difficult. Clio is clearly an unhappy woman. When she married Calliope's father and moved to America, she was desperately unhappy and the marriage was volatile. Even after returning to live in Greece, Clio was still somewhat estranged from her brother and sisters. She was included in family events but always on the periphery, never fully embraced in the same way as her sisters were, and it all goes back to the events of the past. Whilst it would be easy to blame Clio for all the difficulties in the mother-daughter relationship, it is also clear that Calliope has many issues of her own. They initially stem from her unhappy childhood, from that feeling of distance that she has from her mother, of being unloved. During her childhood, the best parts were the summers that she spent staying in Greece. There she knew that she was loved by her aunts, and especially by her uncle, and by her cousin. But as an adult Calliope struggles to draw people in, and that's when she is not actively pushing people away! Her fiance, Jonah, wants to visit Greece with her, but Calliope is not at all convinced that he loves her enough to stick around so won't even tell her family about him, but then it is things that Calliope does that sabotages the relationship, things that make it difficult to fully respect Calliope as a character. As a grown woman who has a difficult relationship with the difficult woman that is my mother, I could relate to a lot of the feelings that Calliope expressed. Despite being a grown up, despite knowing what she is like and knowing what to expect, that doesn't stop it from being disappointing when yet again she doesn't act or react in the way that you believe a normal parent should. I think I could particularly relate as my mother arrives in town for a couple of days this week and so I could absolutely relate to the way that Calliope viewed their interactions with a sense of duty rather then the excitement of seeing her mother. The story is split between modern and WWII narrative with it probably being about a 60/40 split. I do like the dual narrative being used as a tool to tell this kind of story. The writing was smooth, and I found it easy to fall into the pages of the story and stay there and as a result it was quite a fast read. Whilst not perfect, I did enjoy this book a lot, and I hope to read more from the author in the future. Perfect for fans of Tatiana de Rosnay’s Sarah’s Key,this stunning debut novel brings to life World War II-era and modern-day Greece—and tells the story of a vibrant family and the tragic secret kept hidden for generations. I can relate to the feelings about the character's mother, and yours too. I think that alone would make me want to read this book, but from what you've detailed here, it sounds like there is a lot to discover, and a lot to take in. I have just added it to my wishlist, and it's not going to linger there long. I am getting this one soon. Superb review today! !